Roughly bounded by 3rd and 7th avenues, and Turney and Minnezona avenues. 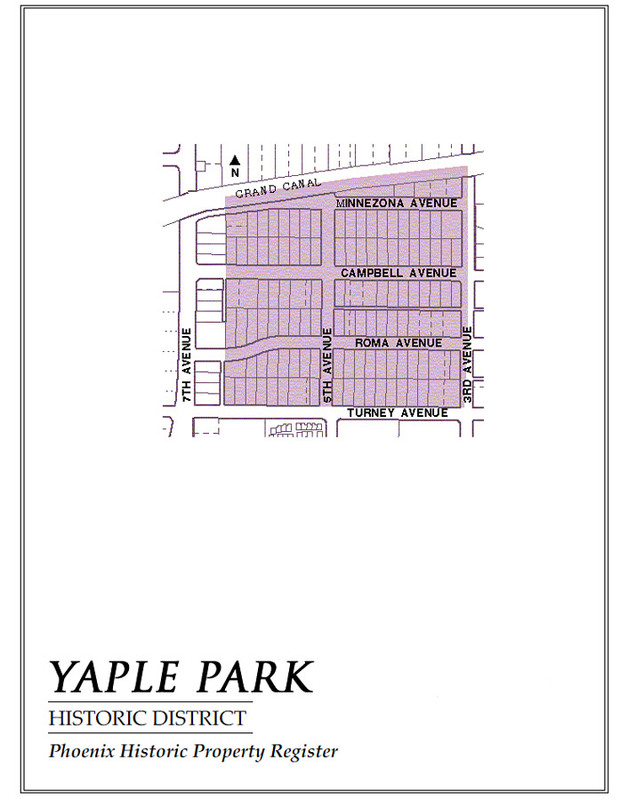 Yaple Park can be found near the northeast corner of 7th Avenue and Indian School Road in central Phoenix. It is a small district on only 3 streets, but neighboring homes share some of the same great amenities. 7th Avenue for one. 7th Avenue is home to a variety of independent businesses, dubbed Melrose on Seventh by the merchants who worked to make it a pedestrian friendly and happening place. Dinner, coffee, antiques, pet grooming, a pharmacy (not a Walgreens) are all just steps away from the residential Yaple Park neighborhood. The Grand Canal creates a northern edge to Yaple Park and serves as a walking and biking path. To the east of Central Avenue, the 75-acre Steele Indian School Park has been beautifully remade to include walking paths, an outdoor amphitheatre, and a dog park where Fido can run off leash. But back to Yaple Park itself. Yaple Park was originally marketed as a pleasant suburb just a few minutes from the offices downtown. While the city of Phoenix has grown around and far beyond Yaple Park over the years, Yaple Park has maintained its suburban feel. Green irrigated lawns, and mature palms and pine trees, and the Grand Canal are reminders that this was agricultural land not all that long ago. The lack of curbs and sidewalks, and the low lit streets, add to the non-urban mood. The homes are predominantly Transitional Ranch style, simple in design with long shallow porches. The slow development of Yaple Park between 1931 and 1949 resulted in the changing styles of those years, so these are far from cookie-cutter Ranches. You will also find a few older Period Revival style homes and a few modern homes, if that is your preference. Bicyclists: Grand Canal paths lead directly to old town Glendale to the northwest or downtown Tempe to the southeast, either about a 10 mile ride. Grand Canal also connects with other canal paths that lead all over the valley. Stunning remodel in the heart of Central Phoenix. Everything is brand new, a huge corner lot and close to everything!